One more day until spring break! Looking forward to a month of no to school so I can go camping, hopefully do another mural, plan some lessons, and take some time to just chill. 20 minutes less with each 5th grade class this week due to parent conferences. How about we draw some big waves to get in gear for spring break and some possible beach time. 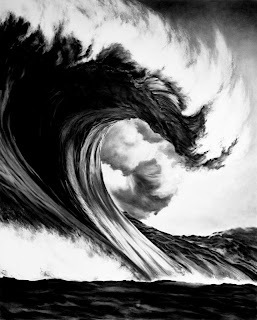 I have admired the work of Robert Longo for years. His choice of subject, his technical skill, and the size of his work all draw me in and keep me looking. A few years back he did a series of large charcoal drawings called Monsters. Each drawing is of a seriously ferocious looking wave. 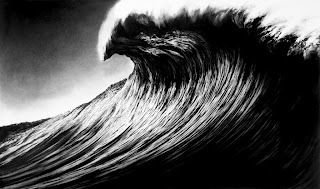 Longo works from personal photos as well as photos from surf magazines and other resources. He doesn't merely copy a photo, he combines them and creates something new. For the purpose of our short time together, the 5th graders recreated one of Longo's drawings on a smaller scale. One of the 5th grade standards is recognizing abstract, representational, and realistic styles in art. They had already created projects along the more abstract side, so Longo's work is a great contrast to those. The students did an eye drawing last week that had some realistic qualities in terms of value and some abstract qualities in terms of shape. This exercise kept the ball rolling towards creating realistic art. The students agreed that what made Longo's work so realistic was his attention to detail in value, shape, and texture. We drew out a basic contour sketch that located major shapes and value shifts first. I emphasized that this makes drawing more complex things easier. Then we added value to the darkest areas in the drawing using a ballpoint pen. Pencil shading and adding more detail to edges occurred next. Students tried to add value to areas while using a pen or pencil stroke that was consistent to the curve of the wave. They added line and shape patterns to make certain ares look reflective, bumpy, and misty. Students made their drawings on 6x9" sheets of paper, which worked out well for the time frame and for the pen work. Again. like the eye project before it, many students were hesitant at first, but once they applied themselves many students exceeded their expectations and created drawings with a good sense of volume, and variety in texture and value. When I see them after our break I plan on giving them more freedom in subject while still addressing realistic style in their work. Your kids did these in 20 MINUTES!!??? Holy Moly, you are one kick #*s art teacher! They look amazing, D! Fantastic lines; very expressive and powerful.